I'm very fortunate that I live in south central Pennsylvania. I live in the heart of it all and within 1 hour of downtown Lancaster in Lancaster County. Over the years we've shopped numerous times at the Lancaster Central Market so I was super excited to get a chance to review this cookbook that I am featuring today here on my foodie blog. Notes: 25th Anniversary Edition with 288 pages & color photographs throughout. The Central Market, just off the main square in the city of Lancaster, Pennsylvania, is the oldest continually operating farmer's market in the U.S. and was listed on the National Register of Historic Places in 1972. More recently, National Geographic named the Central Market as a travel favorite and the American Planning Association named it one of America's ten greatest public places. Each week approximately 3,000 people visit the market to shop from local organic farmers, truck-patch gardeners, bakers, butchers, cheese-makers, cooks, etc. 25 years ago, Phyllis Good, a second-generation standholder, began writing down favorite recipes of the food she sold. She urged other standholders to do the same and what they brought together was 300 of their very best dishes. The collection became "The Central Market Cookbook", On September 1st, 2015...the 25th Anniversary Edition was released. At the very beginning of the book is a section that gives you some of the history, changes and current things going on at Lancaster Central Market. If you have never visited and ever get the chance, I highly recommend it! We love visiting several times a year. All of the recipes in this cookbook are laid out in an easy-to-read format and include an ingredient's list and step-by-step preparation directions. Each recipe lists who the recipe came from and I love that! Just a wide variety of recipes and contributors! One of the recipes that immediately jumped out at me is the Oreo Cookie Dessert. My little grand daughter loves Oreo cookies so I am definitely going to be making that recipe. Everything is covered in this one cookbook: appetizers, beverages, main dishes, side dishes, snacks, soups, desserts and everything in-between. It's absolutely fantastic! Just yesterday I found the Baked Squash Recipe on page 121 in the cookbook and made that. It only requires 7 ingredients and was really easy to prepare. My family loved it! 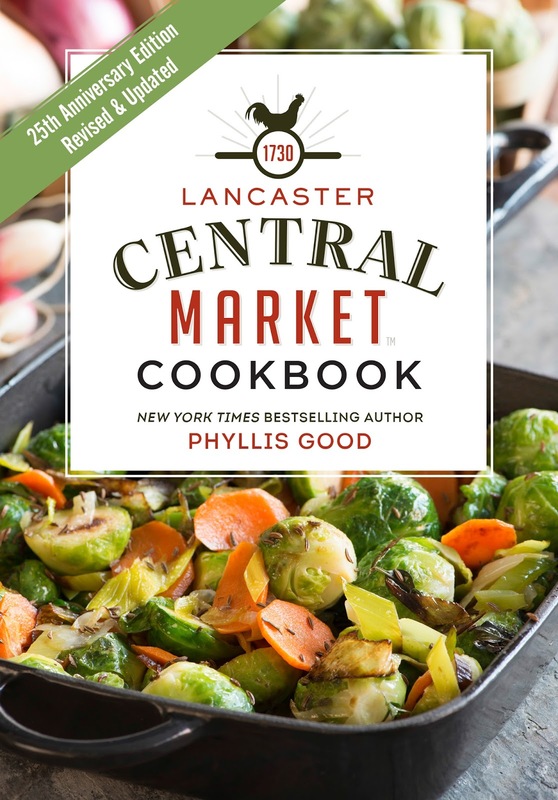 You can purchase the Lancaster Central Market Cookbook by Phyllis Good on Amazon.com. I highly recommend this cookbook to all of you! Disclosure: Shelly received a complimentary copy of this cookbook to feature here on her foodie blog. No monetary compensation was received. Regardless, Shelly's thoughts, opinions and words are 100% her own words & unbiased opinion. There seem to be very good recipes here. I would like to try the crab soup and the squash casserole first.